If you don't already know about SketchUp, the free** tool from Google, temporarily stop reading this post and point your browser to the SketchUp site to download your favorite flavor. I know a fellow exhibit developer that calls SketchUp "AutoCAD for Dummies." While SketchUp may have a much more straightforward learning curve than other 3D programs, the results are beautiful and professional even for a clod like me. 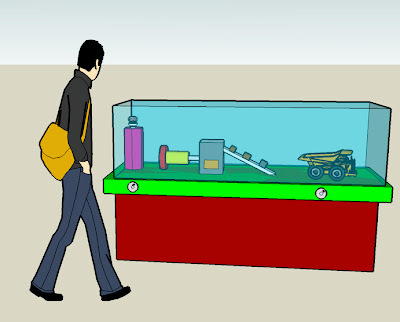 (The drawing above is a simple SketchUp rendering that I created for a museum project.) So download SketchUp and give it a whirl! I'd be interested in setting up a network for sharing SketchUp models and projects related to exhibits and museums. Anyone else interested? Hey Paul, Did you get any interest in a group for exhibit designers using Sketch up? Would love to be part of the group. Yes I agee with Mark. Would love a group for exhibit designers using SketchUp. I am currently doing freelance work and use SU exclusively now for design development. Then I import to AutoCad for technical drawings. Recently started fooling around with Podium to anenhance my renderings!